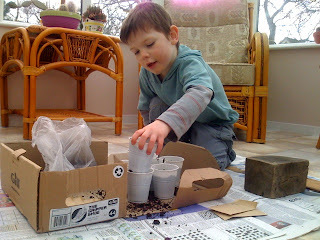 Inspired by the Enterprise Week at my school and our brilliant idea to sell Sunflower Growing Kits, here is Max putting the kits together for members of his family. They made great little Easter gifts. Innovative idea. Great! Keep up the good work. Sometime back, I read a group of kids at their school started recycling mobile phones campaign awareness. They collected mobile phones and sent them to recycling, money collected, they used for school functions. Keep up bright guys!